The Latino electorate is demographically different from other groups of eligible voters, and also it is different than the nation’s Hispanic population overall. 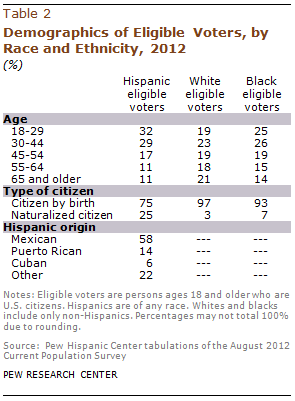 According to Pew Hispanic tabulations of the 2012 August Current Population Survey, Latino eligible voters are younger than either white or black eligible voters. Overall, nearly one-third (32%) of all Hispanic eligible voters are ages 18 to 29, compared with 19% among whites and 25% among blacks. In addition, a smaller share (11%) of Latino eligible voters are ages 65 or older, compared with white (21%) or black (14%) eligible voters. Hispanic eligible voters are also more likely to be naturalized U.S. citizens than either white eligible voters or black eligible voters. One-quarter of all Hispanic eligible voters are naturalized U.S. citizens, while just 3% of white eligible voters and 7% of black eligible voters are naturalized U.S. citizens. Among Latino eligible voters, 58% are of Mexican origin, 14% are of Puerto Rican origin, 6% are of Cuban origin and 22% are of Central American, South American or other Hispanic origin, according to the Pew Hispanic analysis. This differs from the overall Hispanic origin distribution of the general U.S. Hispanic population in which some 64% are of Mexican origin, 9% are Puerto Rican and 5% are Cuban origin.